“Am I too old for this?” I asked myself as I joined three twenty-something participants in a 5 day course to learn glacier travel and ice climbing. I was two decades older than them and worried I wouldn’t be able to keep up, worried I had no business taking this beginner course at my age. When I was a kid, I didn’t know anyone who climbed. Despite living close to the mountains, the people I knew seemed content to drive the scenic highway and stare up at the mountains through car windows. When I was 12 years old, my dad made a friend who liked hiking. I’ll never forget the day they took us kids out on a hike and promptly led us off route, along goat trails, hiking straight up the side of a gravelly slope. Although we never found the trail, I loved exploring and discovering how the trees grew from rocky cliffs and the lichen seemed glued to the boulders. Later that summer, Dad tried again. This time, we found the trail and followed it through forests and meadows, winding our way up a valley in the shadow of towering, snow covered mountains. I was shocked when we rounded a bend in the trail and saw a tent set up in a clearing. A young lady emerged from the tent and I was quick to ask “Where’s your car?” We were far from any road. When she explained how she had hiked to the spot, with everything she needed in a backpack, a whole new world opened up for me. I couldn’t wait to try backpacking when I got older. But adulthood brought two kids and a very full-time job. I had little time for mountain exploration. I read books and magazines about people who backpacked and even a few crazy souls who dared to climb rocky cliffs protected only by a rope. I longed for the backpacking but never thought I’d be brave enough to try the climbing. A couple of decades later, with work and family pressures reduced, I decided to try some mountain adventure. A Google search led me to Yamnuska Mountain Adventures. I salivated over the mountaineering trips they offered, remembering how great I felt in the mountains and imagining standing on top of one of the towering giants that captivated me as a child. I signed up for a program that caught my eye, the Yoho Peaks mountaineering trip. The goal was four peaks in four days. Two weeks before the program, an e-mail from Yamnuska informed me that my guide would be Barry Blanchard. Barry is a legend in the Canadian Rockies with many first ascents of highly technical routes that challenge even the most seasoned mountaineers. Over four days, I learned so much from Barry as he patiently led me up four magnificent peaks under brilliant blue skies. At the end of the trip, I was longing for more mountaineering experiences and asked Barry to recommend some mountains within my abilities. He told me I could climb Mount Victoria and Mount Lefroy (postcard peaks near Lake Louise) but that I should learn some rock climbing. I was so excited by the idea of climbing these peaks that I took a leap and signed up for Yamnuska’s beginner rock climbing course. In this two day course, Yamnuska’s excellent rock climbing guide had me feeling safe and confident on the rock. I signed up for the optional third day of the course which was not instructional. Instead I climbed a multi-pitch route, called Aftenroe, behind the guide. It was a great beginner climb and really built my confidence while taking me up the side of a mountain to a high ledge where we watched a bald eagle riding the wind currents below us. It was a life-changing experience and I knew I would rock climb again, as much as possible. One of the other participants in the Outdoor Rock Intro course invited me to join her for Yamnuska’s Intro to Alpine Ice. I felt the course was way over my head and out of my comfort zone. When I called Yamnuska to learn more about it, the reservations coordinator assured me I had the needed skills. I was still uncertain but signed up anyway, hoping to learn more about glacier travel and the skills needed to be safe in the mountains. The course delivered more than I expected and I spent my 45th birthday learning glacier travel skills and practicing crevasse rescue. I even had a chance to try ice climbing on the toe of a glacier. The Yamnuska guide made it safe and very enjoyable. 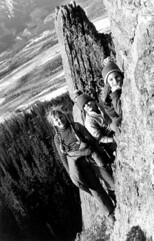 So much so that I signed up for an ice climbing course with Yamnuska that winter. I quickly realized that my enjoyment of these activities increased with my fitness so I researched and read everything I could find on training for climbing, mountaineering, alpinism, and endurance. There is a specific kind of strength and fitness needed for mountain activities and I created training programs to develop them. Two years almost to the day after that Outdoor Rock Intro course, I led two of my friends up Aftenroe. Since then, I’ve climbed some fantastic multi-pitches, some of Canada’s 11,000ers and some amazing alpine routes, both with guides and with friends. 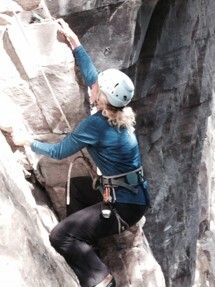 Although I didn’t discover it until after I turned 40, my passion for climbing and mountaineering keeps growing. 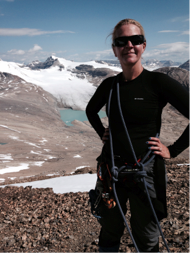 Recently I partnered with friend, long-term personal trainer and fellow mountain-lover Paula Macdonald to create a business, Mountain Fitness Training, to help others get fit for mountain adventures. I’ve learned that if you’re ready to take that next step exploring and enjoying the mountains, it doesn’t matter how old you are. All you need is a willingness to learn and some mountain fitness. A great mountain guide makes it much easier too!